Dominic Hannigan and Gerald Nash are among those calling for an apology to be made by the government for the State’s role in admitting thousands of women to the laundries. A NUMBER OF Labour TDs have said that the government needs to make a formal apology for the State’s involvement in the Magdalene Laundries following the publication of an inter-departmental report yesterday. The findings of an 18-month review carried out by outgoing senator Martin McAleese and civil servants found that the State was responsible for admitting over 2,120 women in to the laundries through various processes including the criminal justice system. This amounted to over a quarter of the women who were admitted to the laundries between 1922 and 1996 and has led to widespread calls, so far unheeded, for a full government apology for the State’s treatment of these women. This morning, Justice Minister Alan Shatter declined to admit the State’s involvement in admitting women and girls to the laundries which he said were “a cold and harsh environment”. He said he would be raising the matter at Labour’s parliamentary party meeting this evening and said that he was “fairly sure” his views were shared by others in the party. Louth TD Gerald Nash tweeted that a “full, sincere” apology was needed while his fellow TD in Dublin North Central Aodhán Ó Ríordáin said that it is “clear that the state owes the Magdalene women an apology”. “Quick progress on this issue is important,” he tweeted. Labour chairman Colm Keaveney, who is outside the parliamentary party following his vote against measures in the Budget, is also calling for an apology and said that “at a minimum” this is what should have happened yesterday. He said that the government’s response to the report’s publication yesterday “failed to capture of the appetite of a nation” for an apology to be made. “The failure to [apologise] has left these women feeling abandoned once again by a State that failed them so miserably in their youth and, worse than that, actively colluded in the wrongs committed against them,” he said. The Fine Gael parliamentary party also meets this evening. 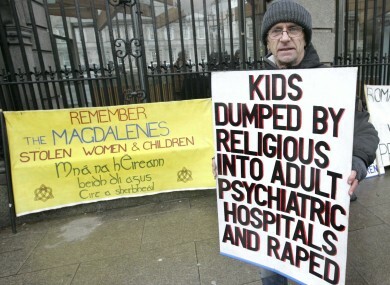 Email “Labour TDs say government needs to apologise over Magdalene Laundries ”. Feedback on “Labour TDs say government needs to apologise over Magdalene Laundries ”.